SGB Donkey Kong Land 2 (USA/Europe) "102%" in 57:09.82 by legoking831. 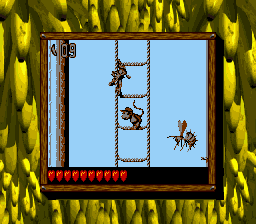 In what is essentially a port of Donkey Kong Country 2 to the Game Boy, Diddy Kong and his girlfriend must rescue Donkey Kong from Captain K. Rool. Along they way they are distracted by a copious amount of shiny coins and other miscellaneous tasks. This movie achieves 102% completion, which is the maximum allowable by the game. Note: mike89 contributed to the final two levels and boss for this run, but since his contribution was so minute he has opted out of being listed as a co-author.